ncient Elliptical Trainer – Is It Worth Your Money? It is no wonder that elliptical machines, or rather just ellipticals are getting more popularity every year. They are great, usually affordable machines for cardio. It is a great way to improve your condition and lose excess weight, if you need to. Today, I’ve taken a closer look at ncient elliptical trainer. Ncient brand manufactures all kinds of equipment, like elliptical trainers, foot massage machines, treadmills, electric massagers, etc. But today, we care only about their main elliptical, so without further due, let’s dive right into the features. The frame of the machine is made of steel tube. It operates on magnetic resistance with 8 different levels that you can adjust to fit your needs. Thanks to the V-belt drive and 12 lbs flywheel you will enjoy smooth and quiet ride. The 13-inch pedals with non-slip design will ensure comfortable and safe use. The included digital monitor provides you with information such as distance, time, speed, calories burned, scan and target zone heart rate monitor. Ncient elliptical also comes with transportation wheels for easy transfer. The assembled dimensions are 40.9 x 18.9 x 63 inch (104 x 48 x 160 cm) and the weight is 79 lbs (35.8 kg). Maximum weight support is 265 lbs (120 kg). First thing to note is assembly. The ncient elliptical trainer does not come pre-assembled, so you have to do it yourself. Good news is that it’s fairly easy to assemble with the included manual. It’s doable by one person and you should be done within one hour. After the assembly I guess you will be quite surprised how sturdy the machine is. Honestly, it does not look very sturdy from the first look, but that might be just my opinion. However, upon testing it out, I can safely say that it will hold the maximum advertised weight and will not wobble on even, firm floor. The LCD display is pretty standard, but there is not much else to expect from it. The stats like distance, time and calories burned are accurate, so no issue here. It is also quite small, but since you are close to it, it does not really matter. Thanks to the belt-driven mechanism and quality flywheel, the ncient elliptical is super-quiet. You can easily workout while watching TV or simply listening to music. You also won’t bother anyone sitting in the same room. The pedals are 13-inches long and come with non-slip design. They are also quite comfortable, although you should not workout barefoot. Thanks to the transportation wheels, you can move it around without issuing too much effort. Actually, there isn’t much to complain about, maybe except the maximum weight limit and the fact that it only comes in one color combination. 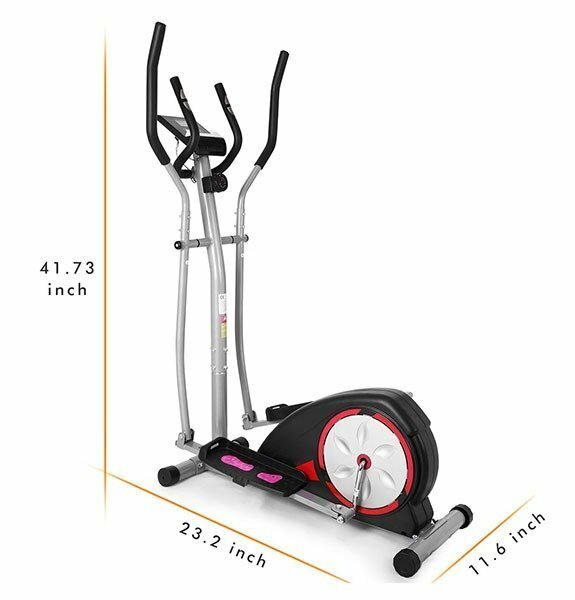 Would I recommend ncient elliptical as a home cardio machine? I absolutely would. Besides the assembly time and color (which could be better) there is not much to complain about. It is a great, sturdy, quiet machine for a great price. To put it simply, it’s definitely worth getting.